Clojure has types, after all it runs on the JVM and included java.lang library in ever project. Types are infered at runtime, saving you the need to design types yourself. Sometimes you want to ensure a value is of a particular type and you can use Java to do this. When you create a new java.lang.Integer object you can provide a default value by passing either a number or string type. The . function essentially instantiates a new object from the class, in this case Integer, passing any arguments to its constructor. Hint Example: converting the port number read from an environment variable as a string which needs to be passed to the Jetty server as a number. See the Clojure Webapp workshop an example. Swing GUI coding in Java feels quite messy to me, however using Swing in Clojure feels much cleaner. Using the doto function allow you to chain function (Java method) calls together. Note Start with the import function to add the neccessary swing libraries. Then create a button and add it to a panel, adding that panel to a frame. Now evaluate the say-hello function to see the new button in action. Hint Seesaw is a really nice library for swing development. Also talk a look at the Seesaw minesweeper series. There are a few more details to the dot operator than that, and if you&apos;re interested in exploring it further you can look at clojure.org&apos;s documentation on Java interop. Input/output involves resources, be they files, sockets, buffers, or whatever. Java has separate classes for reading a resource&apos;s contents, writings its contents, and for interacting with the resource&apos;s properties. Noticeably missing from this list of capabilities are reading and writing. To read a file, you could use the java.io.BufferedReader class or perhaps java.io.FileReader. Likewise, you can use the java.io.BufferedWriter or java.io.FileWriter class for writing. There are other classes available for reading and writing as well, and which one you choose depends on your specific needs. Reader and Writer classes all have the same base set of methods for their interfaces; readers implement read, close, and more, while writers implement append, write, close, and flush. So, Java gives you a variety of tools for performing IO. A cynical person might say that Java gives you enough rope to hang yourself, and if you find such a person I hope you give them just enough arms to hug them. ; =>  - chop up what nasty multi-headed snake thing"
; => "- capture cerynian hind like for real"
; => "- get erymanthian pig what with the tusks"
Of course, you can also use the read and write methods for resources. It doesn&apos;t really make much of a difference which you use; spit and slurp are often convenient because they work with just a string representing a filesystem path or a URL. That should be enough for you to get started with IO in Clojure. If you&apos;re trying to do something more sophisticated, definitely take a look at the clojure.java.io docs, the java.nio.file package docs, or the java.io package docs. In this chapter, you learned what it means for Clojure to be hosted on the JVM. Clojure programs get compiled to Java bytecode and executed within a JVM process. Clojure programs also have access to Java libraries, and you can easily interact with them using Clojure&apos;s interop facilities. The &apos;.&apos; special form is the basis for access to Java. It can be considered a member-access operator, and/or read as &apos;in the scope of&apos;. If the first operand is a symbol that resolves to a class name, the access is considered to be to a static member of the named class. Note that nested classes are named EnclosingClass$NestedClass, per the JVM spec. Otherwise it is presumed to be an instance member and the first argument is evaluated to produce the target object. If the second operand is a symbol and no args are supplied it is taken to be a field access - the name of the field is the name of the symbol, and the value of the expression is the value of the field, unless there is a no argument public method of the same name, in which case it resolves to a call to the method. If the second operand is a symbol starting with -, the member-symbol will resolve only as field access (never as a 0-arity method) and should be preferred when that is the intent. If the second operand is a list, or args are supplied, it is taken to be a method call. The first element of the list must be a simple symbol, and the name of the method is the name of the symbol. The args, if any, are evaluated from left to right, and passed to the matching method, which is called, and its value returned. If the method has a void return type, the value of the expression will be nil. Note that placing the method name in a list with any args is optional in the canonic form, but can be useful to gather args in macros built upon the form. Note that boolean return values will be turned into Booleans, chars will become Characters, and numeric primitives will become Numbers unless they are immediately consumed by a method taking a primitive. The member access forms given at the top of this section are preferred for use in all cases other than in macros. (doto instance-expr (instanceMethodName-symbol args)) Macro. Evaluates instance-expr then calls all of the methods/functions with the supplied arguments in succession on the resulting object, returning it. Special form. The args, if any, are evaluated from left to right, and passed to the constructor of the class named by Classname. The constructed object is returned. the latter expanding into the former at macro expansion time. (set! (. instance-expr instanceFieldName-symbol) expr) (set! (. Classname-symbol staticFieldName-symbol) expr) Assignment special form. When the first operand is a field member access form, the assignment is to the corresponding field. If it is an instance field, the instance expr will be evaluated, then the expr. In all cases the value of expr is returned. Note - you cannot assign to function params or local bindings. Only Java fields, Vars, Refs and Agents are mutable in Clojure. (memfn method-name arg-names*) Macro. Expands into code that creates a fn that expects to be passed an object and any args and calls the named instance method on the object passing the args. Use when you want to treat a Java method as a first-class fn. (bean obj) Takes a Java object and returns a read-only implementation of the map abstraction based upon its JavaBean properties. Many of the Clojure library functions have defined semantics for objects of Java types. contains? and get work on Java Maps, arrays, Strings, the latter two with integer keys. count works on Java Strings, Collections and arrays. nth works on Java Strings, Lists and arrays. seq works on Java reference arrays, Iterables and Strings. Since much of the rest of the library is built upon these functions, there is great support for using Java objects in Clojure algorithms. Clojure supports the dynamic creation of objects that implement one or more interfaces and/or extend a class with the proxy macro. The resulting objects are of an anonymous class. You can also generate statically-named classes and .class files with gen-class. As of Clojure 1.2, reify is also available for implementing interfaces. Expands to code which creates a instance of a proxy class that implements the named class/interface(s) by calling the supplied fns. A single class, if provided, must be first. If not provided it defaults to Object. The interfaces names must be valid interface types. If a method fn is not provided for a class method, the superclass method will be called. If a method fn is not provided for an interface method, an UnsupportedOperationException will be thrown should it be called. Method fns are closures and can capture the environment in which proxy is called. Each method fn takes an additional implicit first arg, which is bound to this. Note that while method fns can be provided to override protected methods, they have no other access to protected members, nor to super, as these capabilities cannot be proxied. Clojure supports the creation, reading and modification of Java arrays. It is recommended that you limit use of arrays to interop with Java libraries that require them as arguments or use them as return values. Note that many other Clojure functions work with arrays such as via the seq library. The functions listed here exist for initial creation of arrays, or to support mutation or higher performance operations on arrays. Once a type hint has been placed on an identifier or expression, the compiler will try to resolve any calls to methods thereupon at compile time. In addition, the compiler will track the use of any return values and infer types for their use and so on, so very few hints are needed to get a fully compile-time resolved series of calls. Note that type hints are not needed for static members (or their return values!) as the compiler always has the type for statics. Clojure provides aliases for primitive Java types and arrays which do not have typical representations as Java class names. For example, long arrays (long-array ) have a type of "[J". Clojure has support for high-performance manipulation of, and arithmetic involving, Java primitive types in local contexts. All Java primitive types are supported: int, float, long, double, boolean, char, short, and byte. let/loop-bound locals can be of primitive types, having the inferred, possibly primitive type of their init-form. recur forms that rebind primitive locals do so without boxing, and do type-checking for same primitive type. Arithmetic (+,-,*,/,inc,dec,<,<=,>,>= etc) is overloaded for primitive types where semantics are same. constructor functions for primitive arrays: float-array, int-array, etc. Type hints for primitive arrays - ^ints, ^floats, etc. Array cast functions ints longs, etc. which produce int, long, etc. amap and areduce macros for functionally (i.e. non-destructively) processing one or more arrays in order to produce a new array or aggregate value respectively. 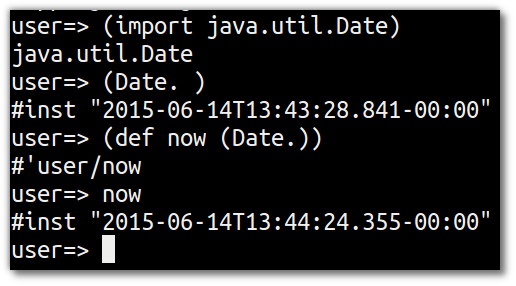 and the resulting code is exactly the same speed (when run with java -server). All arguments are passed to Clojure fns as objects, so there&apos;s no point to putting non-array primitive type hints on fn args. Instead, use the let technique shown to place args in primitive locals if they need to participate in primitive arithmetic in the body. (let [foo (int bar)] ...) is the correct way to get a primitive local. Do not use ^Integer etc. Don&apos;t rush to unchecked math unless you want truncating operations. HotSpot does a good job at optimizing the overflow check, which will yield an exception instead of silent truncation. On a typical example, that has about a 5% difference in speed - well worth it. Also, people reading your code don&apos;t know if you are using unchecked for truncation or performance - best to reserve it for the former and comment if the latter. There&apos;s usually no point in trying to optimize an outer loop, in fact it can hurt you as you&apos;ll be representing things as primitives which just have to be re-boxed in order to become args to the inner call. The only exception is reflection warnings - you must get rid of them in any code that gets called frequently. Almost every time someone presents something they are trying to optimize with hints, the faster version has far fewer hints than the original. If a hint doesn&apos;t improve things in the end - take it out. Many people seem to presume only the unchecked- ops do primitive arithmetic - not so. When the args are primitive locals, regular + and * etc do primitive math with an overflow check - fast and safe. So, the simplest route to fast math is to leave the operators alone and just make sure the source literals and locals are primitive. Arithmetic on primitives yields primitives. If you&apos;ve got a loop (which you probably do if you need to optimize) make sure the loop locals are primitives first - then if you accidentally are producing a boxed intermediate result you&apos;ll get an error on recur. Don&apos;t solve that error by coercing your intermediate result, instead, figure out what argument or local is not primitive. Simple XML Support Included with the distribution is simple XML support, found in the src/xml.clj file. All names from this file are in the xml namespace. (parse source) Parses and loads the source, which can be a File, InputStream or String naming a URI. Returns a tree of the xml/element struct-map, which has the keys :tag, :attrs, and :content. and accessor fns tag, attrs, and content. The ability to use Clojure&apos;s namespaces to locate an arbitrary var, returning the var&apos;s clojure.lang.IFn interface. IFns provide complete access to Clojure&apos;s APIs. You can also access any other library written in Clojure, after adding either its source or compiled form to the classpath. All other Java classes should be treated as implementation details, and applications should avoid relying on them.